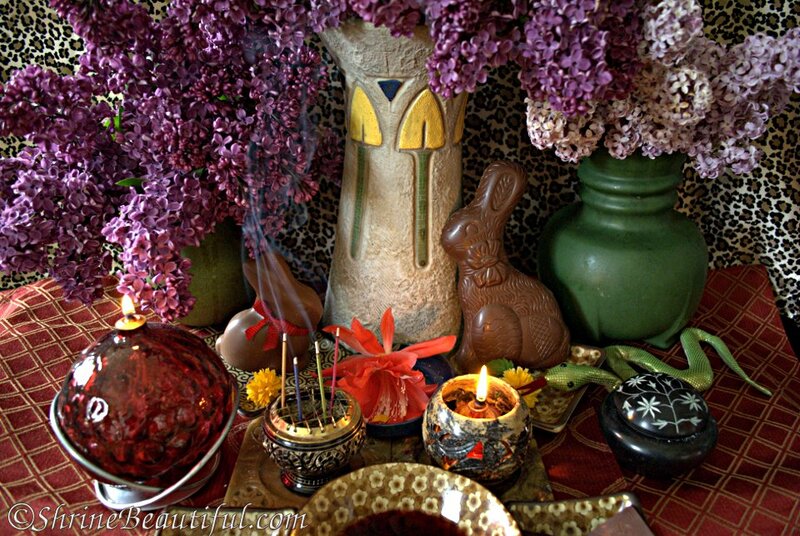 With the approach of Spring and the lilacs getting ready to bloom, I decided to do a special offering. 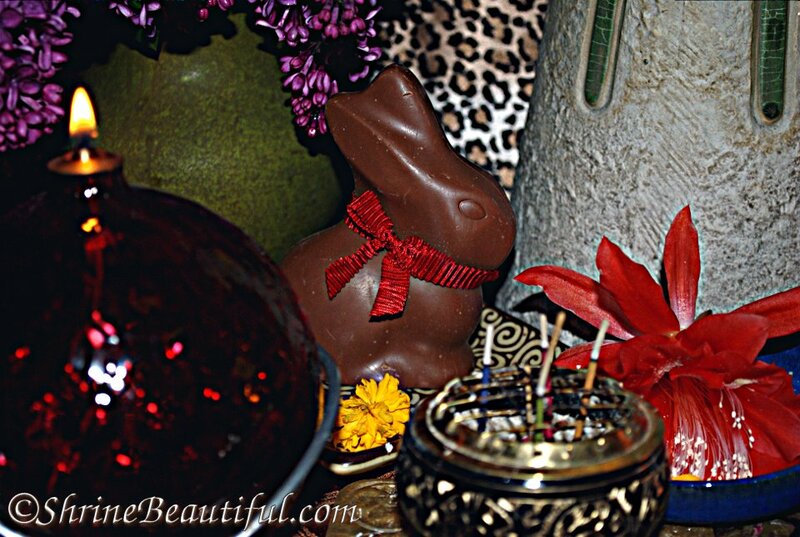 Seeing chocolate rabbits in the store and knowing they’d be discounted soon, I made plans to honor the goddess Wenut (Wenet, Unut), the Swift One. She was shown associated with the snake, and also the rabbit (hare.) King Unas, the pharaoh famous for the Pyramid Texts, named himself after her. The Pyramid Texts are possibly the oldest-known religious texts in the world, so that should give you an idea of how ancient and important she is. If you’re not familiar with the animal-headed symbolism in ancient Egyptian art, I wrote posts on “Animal-Headed Deities” and “Cow Deities in Ancient Egypt?” in my blog Kemetic Reconnaissance. 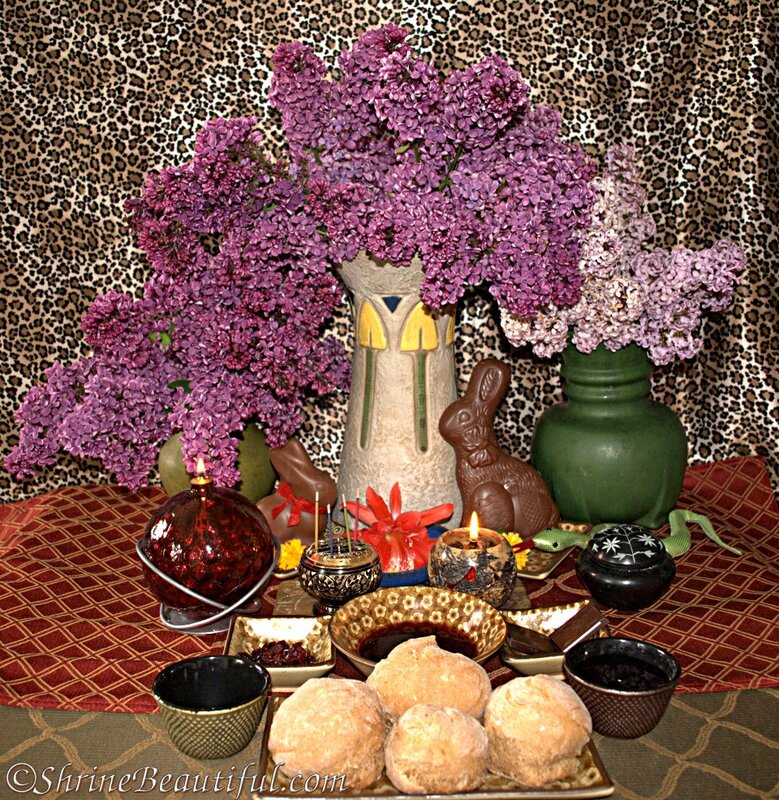 The leopard-spotted fabric I used as a backdrop emphasizes the otherworldly aspects of Wenut. 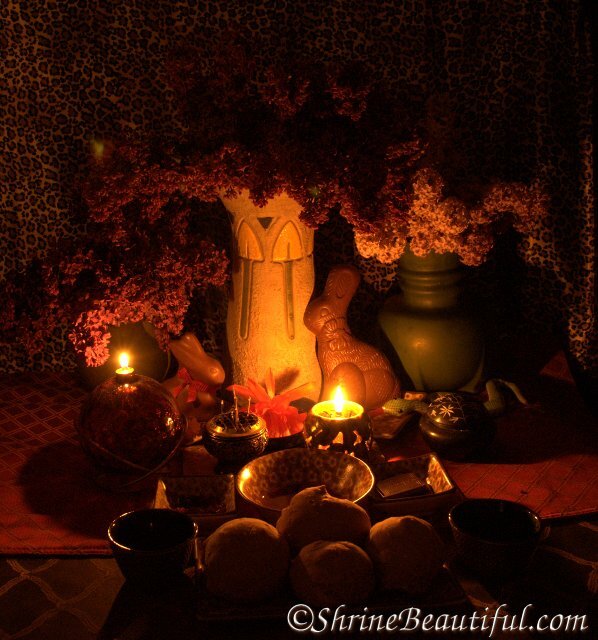 The spots symbolized the stars in the sky, and the stars were sometimes linked to ascended ancestors. Many liminal and otherworldy deities and functions in Egypt became associated with leopard skin for this reason- Seshat, Nut, Anubis and funerary priests to name a few. Flowers were a common offering in temples. The most common was the blue water lily. The opening of the primal water lily is one of the many creation stories. The papyrus flower is another significant symbol. They imported other flowers including the red poppy and cornflower, and floral garlands were put on mummy cases. 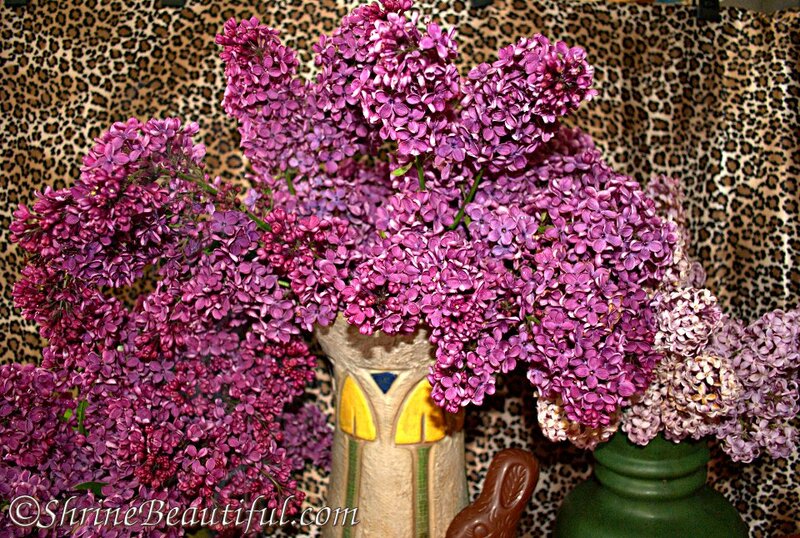 The texture of the lilacs compliments the leopard pattern. I added a red cactus flower, and two small kerria blossoms. Wenut is the sixth of the “Seven Arrows of Bast,” a team of cosmic enforcers who each command their own squad of otherworldly beings. She’s also listed as an Eye of Ra, another ‘job’ with violent/protective aspects. I used the big vintage Roseville pot in the center, with an arrow design, to honor Wenut as an Eye of Ra and Arrow Goddess. Its shape also reminds me of a hypostyle column, like the columns with flaring tops so common in Egyptian temples. In one sense they’re the papyrus flowers in the waters the Boat of Ra sails every day. Flame is another standard offering, and I have two oil lamps on the offering table. When you strike the flame, you are connecting your ritual to the first sunrise. That first light pushed back the formless Nuun, black waters of undifferentiated potential, and created a space for Gods, humans, and everything else to exist. Your flame opens up a sacred space in the same way. The little black soapstone container with a floral-patterned lid contains my natron. Natron is a type of salt that occurs naturally in Egypt. 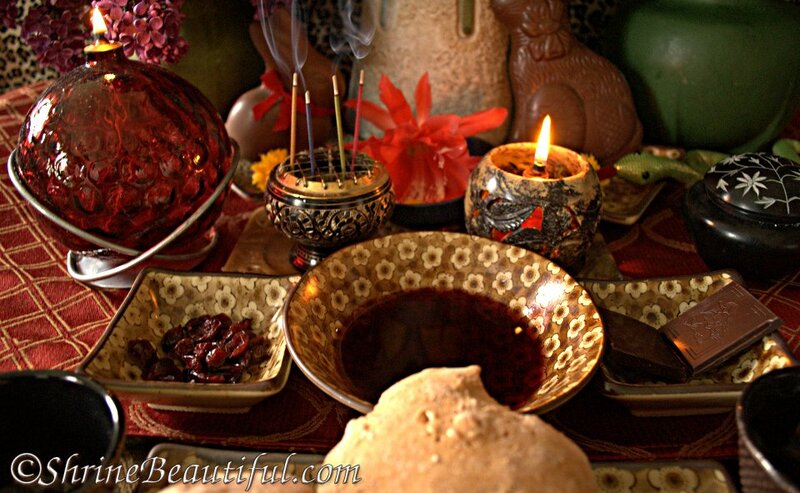 They used it for offerings, purification, cleaning, and also as a dehydrator for the process of mummification. Natron isn’t exported from Egypt, so we cook our own from salt and baking soda. The Netjeru were said to have been made from the sweat of the creator, humans from the tears. We have water and salt (natron!) in common. You can read more in my Bathtime! post. 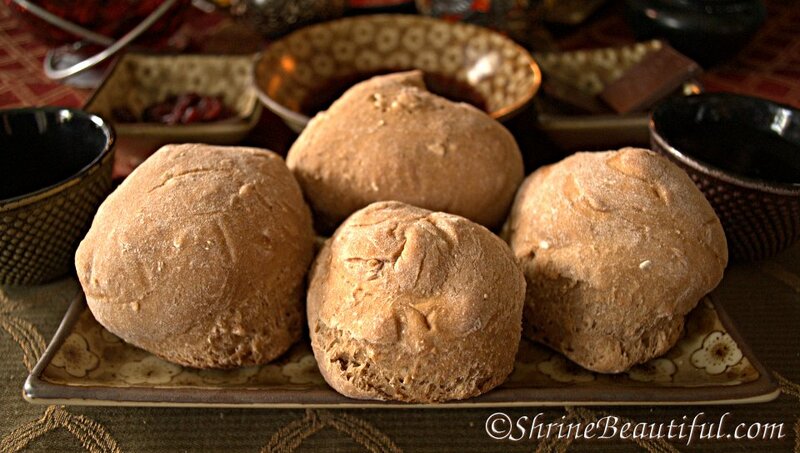 I baked these whole-wheat rolls, and offered four of them. Four is the Kemetic number of completion. Bread is another key Kemetic offering. It symbolizes the collaboration between humans and the Netjeru (Egyptian Gods and Goddesses.) They caused the Nile to flood, providing the water and fertile silt, and also bring sunshine for the wheat to grow. Humans prepare the ground, plant the wheat, tend, harvest, and thresh it. Then they grind the grain into flour, and bake bread out of it. After the ritual, and the Netjeru have absorbed what they want from it, a short “reversion of offerings” is said to return give the physical part of the food to humans. “These, your divine offerings revert. They revert to your servants for life, for stability, for health, and for joy. Oh that the Eye of Heru may flourish for you eternally!” In the ancient temples, the offerings were then eaten by the priests and temple workers, and also given to the poor. This gives a four-part exchange. They provide the materials, humans provide the labor. Humans give goodies to the Netjeru, and the goodies are reverted to humans. “Time to nom” 😉 as one of my friends says. The two bumpy Japanese tea cups are used for a water libation. I pour water from one into the other, tapping the rim of one cup against the other to make it ring before I pour. That’s just a personal habit, but it adds a nice element of sound. 😉 Water is used for purification and renewal. We take it for granted, but in a hot desert country it’s a vital offering. Incense is also significant. Incense is the scent the Netjeru exude. 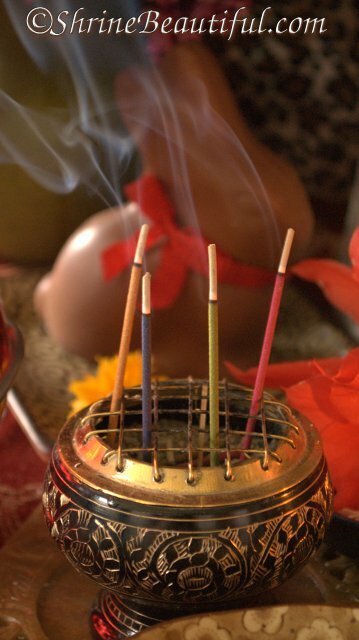 It’s used for purification and rejuvenation, and offering it is another way to open up that reciprocal channel, to send out a ping. I chose Amber, Iris, Rose, and Lotus sticks. Speaking of puns, there’s the chocolate. Of course, the cacao plant is native to the Western Hemisphere, so they didn’t have access to it. But it has become a very common modern Kemetic offering. Quality chocolate definitely falls into the category of “all good and pure things.” The scientific name of the tree that chocolate is derived from is “Theobroma cacao.” Theobroma is usually translated as “food of the gods,” a modern pun connection. The ancient Mayans associated it with their gods. There you go, another excuse to eat chocolate! I don’t think the Egyptians associated the hare with ‘fluffy bunneh.’ Yes, they can be eaten by predators several times their size (can’t we all?) but experienced rabbit-keepers know they can deliver a serious bite (those teeth chop through wood,) and they have strong hind legs with raking claws. The Beast of Caerbannog (Vorpal Bunny) isn’t that far off the mark. The Lindt rabbit was wrapped in golden foil, which I removed. I put the red ribbon back on because it reminded me of the bandlet ribbons used to ‘dress’ the icons of the Netjeru. It matches the red cactus flower. 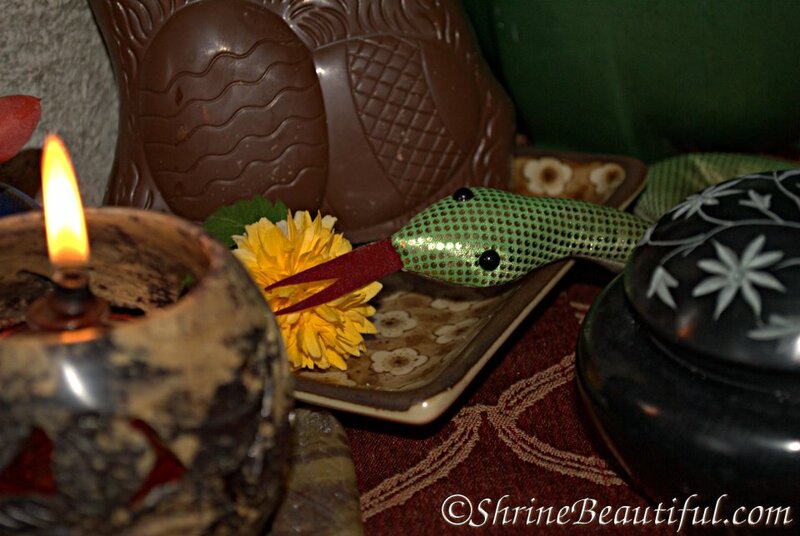 I added my little snake mascot to represent Wenut in snake form, sitting on a kerria flower. I don’t consider the toy to be an icon, she’s more of a visual reference. Usually she’s the goddess Wadjet, surveying my sacred space from a shelf. I’ve read that some snake images were used to represent multiple deities. The same one might be used to represent one goddess for harvest time, but also serve to protect you from nightmares when required, etc. Another photo of the lilacs, just because. My current practice is different from most modern Kemetics. At this point I don’t have any icon statues. One reason is that I didn’t want to buy a resin statue and decided that if I had any icons on my shrine I’d fashion them myself. But I’m picky about design and I don’t rush projects. The other is that I pester a long list of Netjeru (this being a case in point,) and I’d need a heap of statues. Here’s a depiction of Wenut (on the left,) Along with Hethert (Hathor,) and King Mekaura. She’s shown with a hare on top of a processional standard. This is an Old Kingdom depiction, even though some modern references claim she didn’t have a hare aspect until very late in the Ptolemaic period, which started in 307 BCE. This was at least 2,200 years before that! Eternal Egypt by Richard Reidy discusses the meaning of many ancient Egyptian offerings, and offers a variety of rituals. You can find it at Book Depository or Amazon. 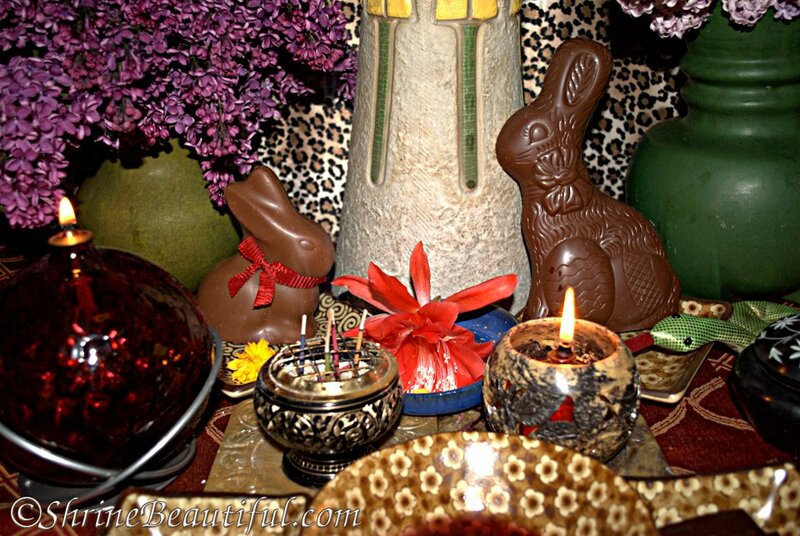 This entry was posted in Holiday / Festival, Kemetic - Egyptian and tagged Ancient Egypt, bread, chocolate, Egyptian Symbols, Eye of Ra, flame, Goddess, incense, Kemetic, offering table, offerings, Pyramid Texts, ritual, Seven Arrows of Bast, Unut, Wenet, Wenut by helmsin2. Bookmark the permalink.